Our new library has a wall painted with magnetic paint in our program room. The paint isn’t very strong so we can’t use a lot of store bought magnets. However, I’ve been dying to use the wall for a “flannel” for a tour group and figured I could make my own with magnetic tape I know works on the wall. Lucky for me, Nik at Narrating Tales of Preschool Storytime and her trusty helper Seth, just created one such board for Stuck by Oliver Jeffers. So here is my copy of that up on our wall. I ran out of time so didn’t show the boy but that’s ok- I’ll be him for the purpose of the story. Check out the Flannel Friday roundup at Anna’s blog. See the flannels on Pinterest by clicking the button on the right side of this blog. Happy flanneling! 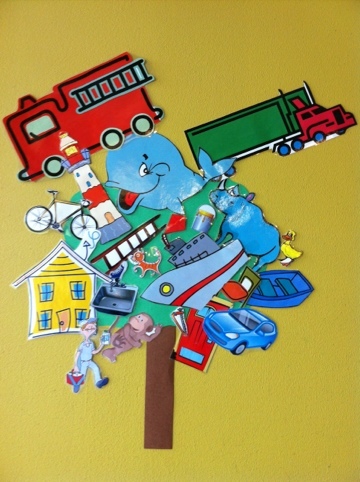 Categories: Flannel Stories, Storytime | Tags: flannel Friday, Magnet board, storytime | Permalink. Holy preschoolers, Batman! There were 91 people at storytime today (folks were coming and going so I don’t think there were that many the whole time)! Sixteen Runaway Pumpkins by Dianne Ochiltree: This was a bigger hit than I thought it would be. The kids loved seeing the pumpkins roll down the hill. Pumpkin Trouble by Jan Thomas: Everyone loved this, but it was nice to hear some grownups laughing REALLY hard throughout. Our craft was torn paper pumpkins or apples so I went through Perfect Square by Michael Hall (no, not the Dexter guy) so they’d see all the cool things you can do with a piece of paper. They were enthralled, surprisingly for being the end of storytime. I’ll definitely use that book again. Bubbles! To Splish, Splash by Bobby Darin. Craft: torn paper pumpkins or apples. Each kid gets a paper plate and tears construction paper and glues it to the plate to make a pumpkin or apple or whatever they want. punch a hole in the top and attach string so you can hang it in your window! Categories: Flannel Stories, Storytime | Permalink. We all know this tried and true rhyme about pumpkins on a gate. But, I wanted to share this because I really love the idea of using an old glove (that one without a mate?) for a fingerplay/flannel. This was in our flannel bin and after giving it a makeover with fresh velcro and new eyes it was ready for the show. The kids LOVED it! 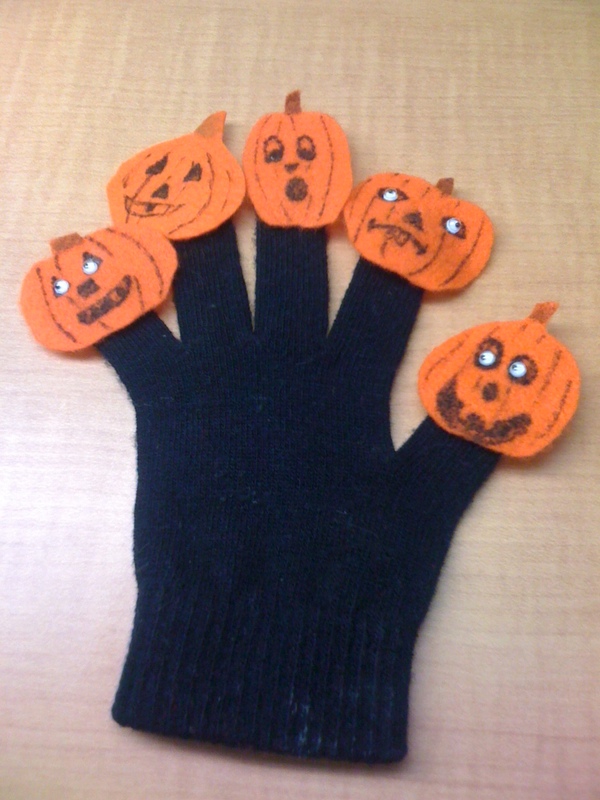 And I heard a mom say “That’s a good idea with the glove.” So double win for Five Little Pumpkins! There are witches in the air-Woooo! For those libraries on a budget who can’t afford to buy a real storytime glove this would work really well. Having a couple of spare black gloves is great for doing puppet shows, too. Mollie’s got the roundup at What Happens in Storytime… and don’t forget to click on the Flannel Friday Pinterest button for pictures of all the lovely flannels from the past months. Categories: Flannel Stories | Permalink. For ever and ever I have loved this book and it really does seem to scream “flannel-ize me!”. Or maybe I’m just nuts (or both). 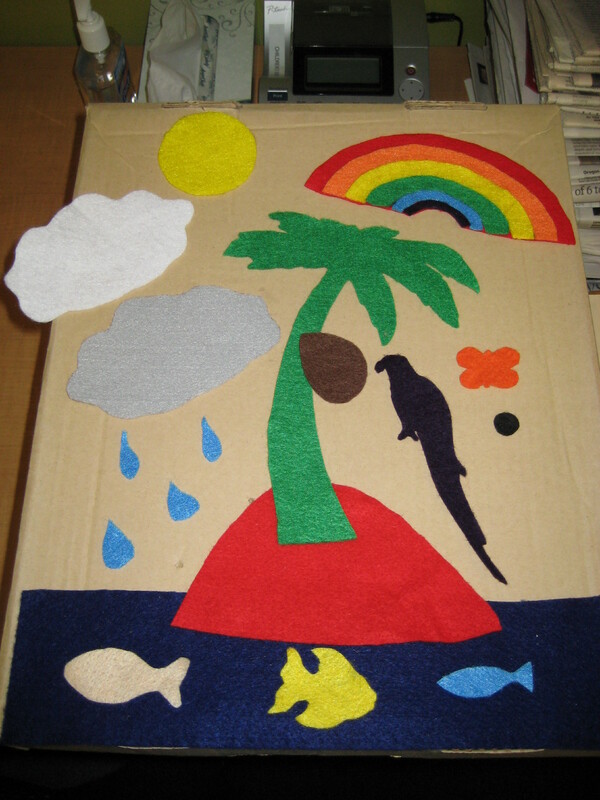 Once again, the inspiration to do this came from the ALSC blog about Special Needs storytime. If you are considering or are currently offering this kind of programming I HIGHLY recommend you read that blog series. DO IT. I’ll make it easy for you. Here’s the link: Special Needs Programming. 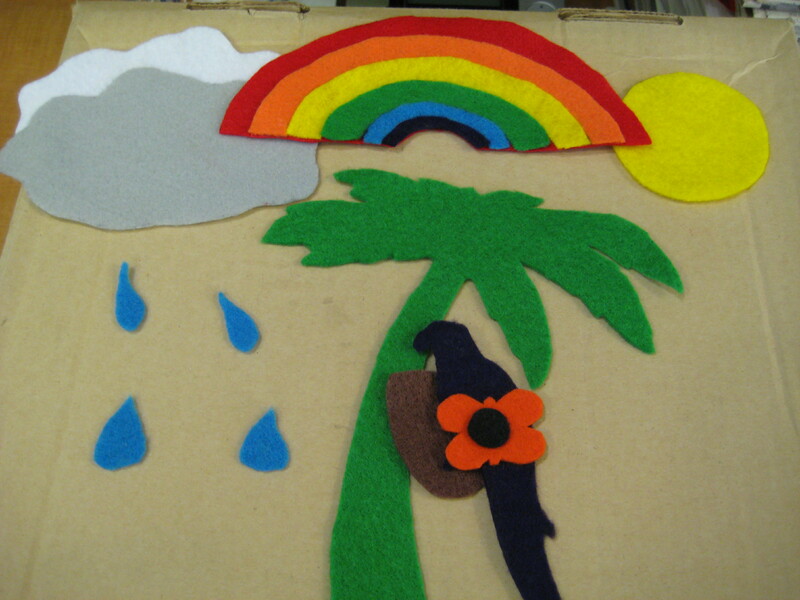 Extra thanks to Miss Celeste for her awesome rainbow and fish makin skills! She even got that purple in so I wouldn’t get in trouble with the kiddos for not having all the colors. In this case indigo and violet are both represented by dark purple. Sorry, kids, no flannel in indigo. Also, if any of you are reading this and haven’t read The Deep Blue Sea by Audrey and Bruce Wood go get it right now. The illustrations are all digital which the kids actually seem to really like and it’s prefect for numbers. I’ve used in Toddler storytime and Preschool with success. Check out today’s roundup at Anna’s blog Future Librarian Superhero and check out the Pinterest account (just click on the awesome Flannel Friday badge on my blog median). Also, Flannel Friday is now on the Facebook! Woohoo! This has long been one of my favorite storytime books and I’ve always thought it would make a great flannel. So, here’s my take on that. I’m no artist but I don’t think the kids will mind. 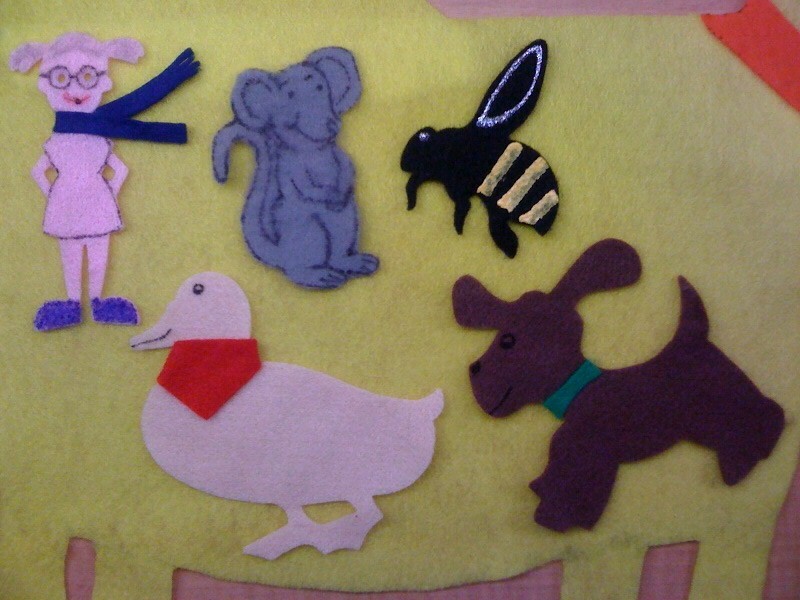 The mouse and bee are borrowed from already made flannel kits and the others are just die cuts with my accessories. Like my attempt to make the little girl look like an old lady? Honestly, the old lady in the book is quite fashionable so it’s not far off (she even has bun pig tails). I’d like to get some more stripes on fat cat, but I’ll have to figure that out later (did I mention I’m not an artist?). And now for their “closeups”. Our department camera is missing so you get the pleasure of seeing my crappy iPhone pics. The duck is actually a different color than the old lady. I swear. Check out the roundup at Miss Mary Liberry. 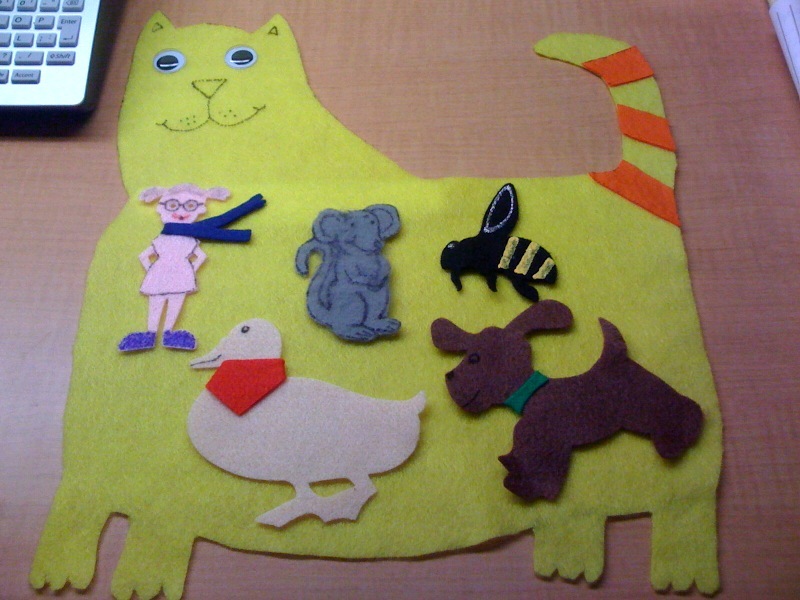 Categories: Flannel Stories, Storytime | Tags: feltboard, flannel stories | Permalink. Here’s a flannel I’ve yet to try, but am excited to. I found it in Mother Goose’s Playhouse by Judy Sierra (pg 71 if you have that book). I liked it mostly because we had most of the dies for the animals so it didn’t take long to create. 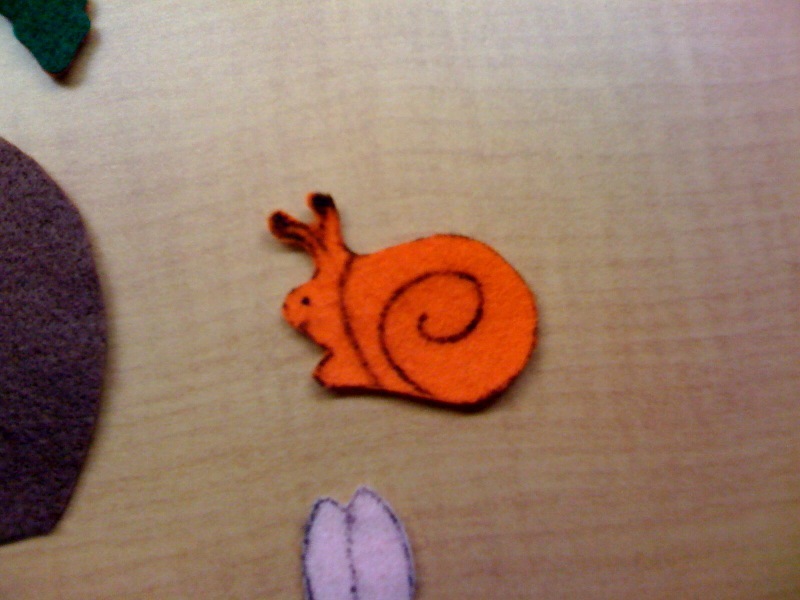 The snail is the only thing I had to do mostly on my own and she’s pretty tiny so it wasn’t a lot of work or time. It’s a Giant Turnip idea only with a carrot. The rabbit starts and tries to pull it out, but can’t. Then squirrel comes along to help to no avail, then turtle with the same result. It’s going to be especially fun to make all the groaning and grunting sounds of pulling the carrot. Finally snail comes along and despite the other animals’ doubts is just the extra muscle they needed to free the carrot. Yay for snails! 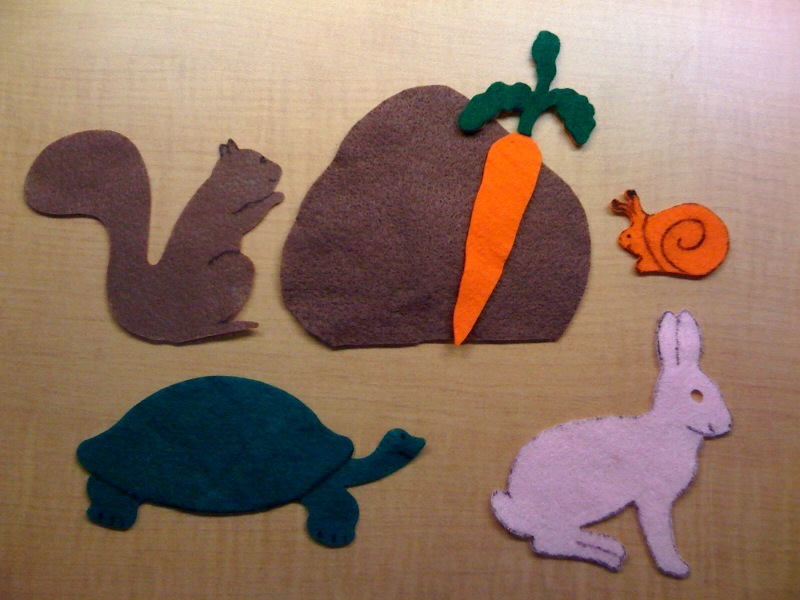 They’ll have to use their imaginations for the “giant” carrot because the die cut was much easier than cutting one out. Can’t wait to see all the other flannel Fridays! Check out the roundup at 1234 More Storytimes. Okay, I know this has been done a gazillion times, but I saw this version on an ALSC blog and had to make it for special needs storytime. It’s super easy to make, and I think the kids will really like being able to put the dots on themselves. I used those velcro dots that are sticky on one side and velcro on the other to mark where the dots go. 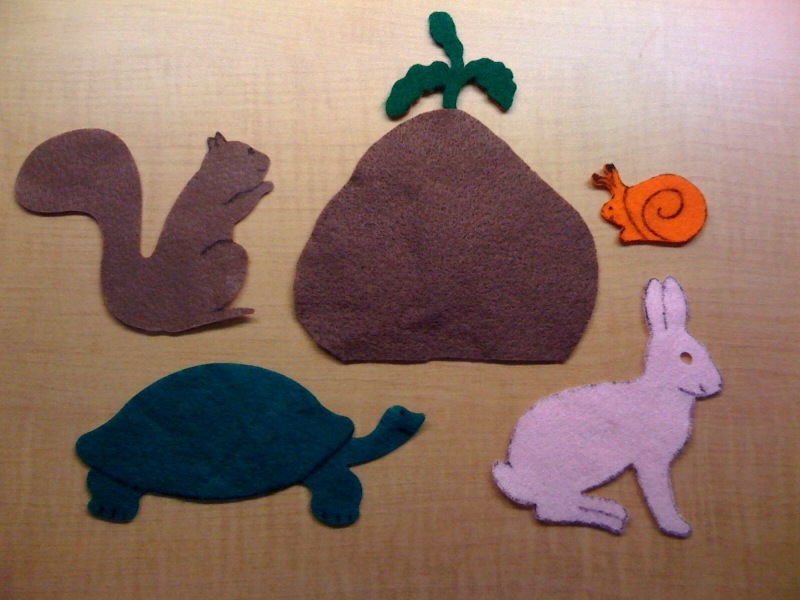 The dots are just felt and the kids will just stick their dot on a velcro dot when we get to their color in the story. See this in action here: http://www.cmlibrary.org/programs/special_needs/default.asp The second video. 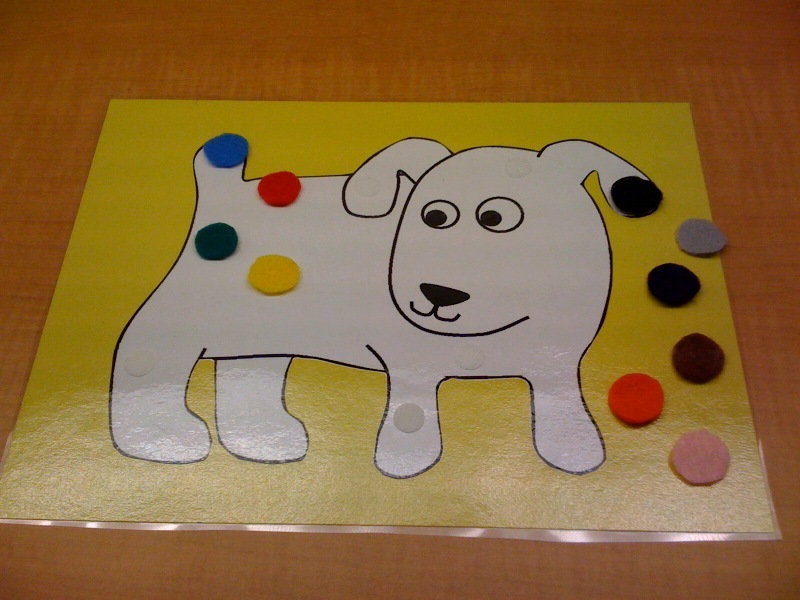 When I do this in preschool storytime I put the dots on while reading the story. This way the kids are involved in the story more. I’ve made an extra set of dots so more than 10 children can participate. To make it more sturdy I’m going to put magnet tape on the back and stick it to a cookie sheet so I can carry it around to non-mobile kids to place their dots. Categories: Flannel Stories, Storytime | Tags: dogs, flannelfriday, storytime | Permalink.